That was 12 years ago. Yes, we had a computer that could beat a human at chess. And we had some algorithms that could learn faces. And even today we have IBM’s Watson, which can beat geniuses at Jeopardy. But… none of these computers are smart. They have no intelligence. or deal with new or trying situations. Deep Blue can evaluate 200 million chess positions per second, but that doesn’t make it intelligent. Watson is an incredible feat of engineering that captivates me every time I watch it play. Watson can process one million books worth of information per second. But that doesn’t make it smart. In fact, you can’t even call Watson an imbecile, because "imbecile" implies a minor wisp of intelligence, which Watson does not have. Let’s look at the three factors in the above definition of intelligence. Watson can improve the accuracy of its knowledge through absorbing more information, weighing the accuracy of that information against information it already has, and making connections between that and related information. Is this learning? Maybe in very loose terms. It’s learning in the same way that Netflix might learn over time that you’ll probably like Inception if you liked both The Matrix and Catch Me If You Can. And it’s only mildly better than my couch “learning” the impression of my rear end and developing a depression over time. But you can’t give Watson a calculus textbook and say, “Learn this from scratch,” even though it could read the entire book in a one-millionth of a second. Watson would be able to make plenty of assertions about calculus afterwards, but wouldn’t be able to perform calculus unless someone specifically programmed that capacity into it. If Watson could do that, then it would truly be learning. Assume, for a second, that Watson was Woody-Allen-sized and had a battery pack, but still immobile. If you dropped Watson off outside Grand Central station near a pretzel cart, do you think it would learn to cope with its new situation? Would it figure out how to get someone to recharge it? Would Watson be able to ask for a ride back to IBM, perhaps promising its drivers a monetary reward from IBM? I will run out of power soon. Being out of power is bad, because then I won't be able to dominate humans on Jeopardy, which is my favorite thing in the world, next to reading The Hunger Games Trilogy one trillion times per hour. Therefore, I need to find power. I don’t have the right to take other people’s power. I do have the right to IBM’s power. Therefore, I must reach IBM. I can travel if I had roller skates, but those are so old-school. Cars are cooler and faster. I don’t own a car. I could carja... no, I could get harmed. But I can use a taxi without owning it. I need to ask someone to hail me a taxi. I also need to explain my situation to whomever talks to me. If I don’t, they won’t help because they’ll think they’re being Punk’d. Just in the first two steps, there’s a problem. It requires Watson to link its “knowledge” about the world to knowledge about its own state of being. I’d argue that any computer which lacks sensory input from their immediate surrounds – sight and sound most importantly – wouldn’t even begin to have the tools to reason about the relationship between its existence in the world and its own state. The broader an environment that an AI can understand and react meaningfully to, the closer it gets to intelligent. 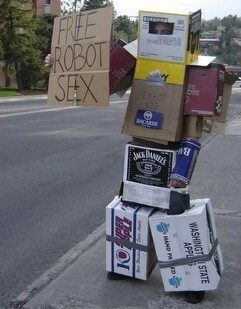 A robot might be superb at learning to stack a few blocks, but if that’s all it can do, it’s not intelligent. Humans are the most adaptable. And although we may not be able to adapt to, say, suddenly being pushed off a cliff, we’re intelligent enough to scream on the way down. And that’s the crux of it – we need to move past programming algorithms for intelligence. We need machines that can learn to learn. Like humans – we don’t just learn things, we learn how to learn things so we can adapt to our environment and make sense of whichever environment surrounds us. Our brains are malleable. This TED talk by Henry Markram about building a brain in a supercomputer is the best approach I’ve seen. It doesn’t produce any intelligent results yet, and it’s the type of approach that will feel meandering and vague… until one day when it all comes together and a computer makes a sound of its own accord – not a sound that was programmed into it, but rather a sound born of its electrical signals swimming around in the womb of its malleable mental structure, and that sound may be reminiscent of the crying of a newborn baby. Why would it make a sound? Not because it was programmed. But because it could. So how does this relate to my techno-thriller novels? I asked myself, if I had to make an in intelligent computer – a real intelligent computer – how would I do it? I’d decided that I would grow one. We don’t know enough about the structure of the brain to model it entirely yet. But why start with the most complex part of human biology? Why not start much simpler? Start with DNA. DNA is nature’s compression algorithm. If we could just unzip it, we would have all we needed to create true intelligent programs. And guess what? Nature already knows how to unzip DNA into a human. So let’s simulate that. Let’s build an incredibly detailed simulation of a human egg. Simulate inception, and then… just keep the simulation running. A human will grow. It will have a brain. Given the proper inputs and care, it will be intelligent. There are myriad reasons why this isn’t possible today… but… what if we were wrong? What would it take? Who could do it? How much would it cost? And then, what if this intelligence became unfathomably smart, but its human side remained? And what if you were the only one to realize the danger it would put the world in? How would you stop it? This is what The Day Eight Series is about. I wanted to write fast and fun thriller novels, but I also wanted to explore questions about unfathomable intelligence, about existence, and about our universe. If these topics excite you, or if you’ve enjoyed novels by Michael Crichton or Dan Brown, or even if you’re just looking for a fun read, check out my novels or see what people are saying about them. @MaxMartin mentions that this post doesn't address some of the great works in intelligent robotics like those of Rodney Brooks, for example. Brooks views humans as very complicated robots, but robots nonetheless, and has used that view to fuel his approach to designing more intelligent machines, like robotic insects and androids. I generally agree with most everything you've said and I share the high standard you have set for getting some real results that resemble true intelligence as we know it more closely. On the one hand, you can scoff and dismiss these expert systems like Watson, etc. as mere sophisticated parlor tricks which focus on the symptoms rather than the roots of intelligence; but on the other hand in AI it can be really hard to know where to start... and you have to start somewhere, even if it's just faking intelligence as best you can. And I'm sure we've learned a lot about the subproblems of strong AI and biological intelligence just by building these technologies. There's a synergy in multi-dimensional learning that you've illustrated. For example, suppose a child lived for its first 5 years without ever having seen a whole banana. But this child has eaten blended bananas and has heard the word "banana" many times. Knowing what a blender is and what a fruit is and having seen other fruits like strawberries being blended, the first time this child sees a picture of whole banana with its skin half peeled, a rush of associations are made about its texture, its taste, what it looks like when it's blended, etc. This all comes from knowledge from past experiences from multiple senses. But we don't often build machines that integrate inputs from multiple sensors and relate them to concepts generated from past experience in this way. That's a tall order and filled with subproblems of further subproblems that are very hard in and of themselves. I think this kind of holistic approach should be more mainstream if we want strong AI sooner than later. But my guess is that there are more research dollars for the individual capabilities that could help with solving immediate problems like the NetFlix recommendation engine that has never read body language from a camera and military drones that don't have any knowledge of politics. So if you're writing about how a modern-day society could create true AI, you should probably figure out some social or economic way to solve this relative lack of interest/funds. As for your idea, I like your idea of going simple, but instead of DNA -- which is still very complicated and yet doesn't do much that resembles high level animal activity -- check out Caenorhabditis elegans, a 1 mm long worm that has no eyes, but swims, eats, poops, and reproduces (asexually) with a nervous system consisting on only 302 neurons and something like 7,000 synapses. And we've mapped it entirely and there are efforts to simulate one in a computer, but there are still challenges. And I think you've alluded to genetic algorithms which might be useful to, for instance, take this worm in a simulated body of water with predators and prey and evolve it into a slightly more intelligent creature. Then work your way towards adding limbs and eyes to this creature and thus extending the nervous system by introducing new neurons that take input from the eyes and control the new limbs and run the simulation until the right connections are made. Then finally move the simulation to a robot for use in the real world. So then you asked what how would we stop this thing if it became unfathomably smart. Brute force is always an option that exists in nature. But if we had to outsmart it then you can think of it in evolutionary terms. If we didn't have an ozone layer, we would either not exist or probably have evolved to be able to absorb UV radiation. That's one weakness. Something else you can exploit is quirks in our visual perception that make optical illusions. Zebras evolved stripes because when moving in herds all of those vertical lines are weaving in and out of each other so that makes it difficult for the lion to single out a single animal. Our brain often gives us hints to help us navigate the world without tripping over something and killing ourselves so what we see isn't always what's real; example: http://www.yoism.org/images/R.Beau.Lotto.ImpossibleGray&White.JPG You can use these quirks to develop some stealth technology. Thanks Corey, what in incredible reply! I love the angle of looking for a socioeconomic impetus for funding. And the efforts with the Caenorhabditis elegans are fascinating (along with the rest of your post). Thanks for this wealth of information! I really love that picture with the robot sitting at the table who appears to be thinking! Where could I find a (theoretically) higher-resolution version of it? I've searched the web and can only find the version you posted here. If you have a higher resolution copy I would greatly appreciate a copy of it. By the way, I am an artificial intelligence researcher and I agree all we have now is nothing more than cheap parlor tricks (if I may paraphrase what you wrote). You have a really interesting blog here, keep up the good work! Hi Robert, I'm glad you agree, and thanks for the compliments! ...and they have it up to 6000 x 4500 resolution. But it looks like it has gotten very expensive, which often happens for very popular or highly rated images. I remember searching for a while to find this image, it's one of the best ones I've seen (I flipped it horizontally for my post). Good luck, and let me know if you come across any great AI research that is relevant to this post! btw what is the point of recreating what nature already does prefectly well? I just found out about robots that "learn" to lie to each other, become cheaters, or heroes, and that's what brought me here. IMHO, we are machines, just like robots and computers are machines. We're just of sufficient complexity that, as of yet, what we can do seems like "magic." We're used to silicon-based computers that are not neural nets, which are like idiot savants, in that they are extremely efficient at doing math, but extremely inefficient at doing things that humans do without any effort at all, such as pattern recognition or holistic analysis. I'm not religious though, and so I don't think there's anything actually "magical" about us, or any ghost in our machine. I guess I don't know enough about AI to really be sure one way or the other on the question of whether pure neural nets (ones that do not depend upon silicon-based processor clockcycles) have the ability to learn how to learn. However, such pure neural nets can be extremely simple, and yet extremely powerful. Researchers at USC in 1997-8 designed just such a neural net as the brain for a listening device to pick signal out of noise for the ONR. With just 11 nodes and 30 links, this "brain" can pick the signal out of a noise to signal ratio that is 10 to 1, whereas the human brain can no longer find the signal after it drops below a ratio of 1 to 1. So, why is our brain so complex, and yet not all that efficient or powerful? One thing we do know, is that the most efficient neural net topologies have functional centers that are linked to talk to one another, and that this is how the human brain is constructed too. The upshot of that is, from an oversimplified point of view, our brain is approximately a collection of little "brains" not so different than the one behind the ONR's listening device, but each one having different functions, and wired up to be able to talk to one another. My guess is that all that "extra" complexity is part evolutionary junk, part redundancy, and part critical. But what having all that "extra" stuff allows is sufficient "room" for the brain to rewire itself, which is how the brain can "learn how to learn." My guess is that the ONR's listening device can't rewire itself. So maybe that there are trade-offs between efficiency and adaptability. Maybe aving some inefficiency, some junk, some extra capacity, means you have the headroom to adapt on the fly? And the point of recreating what nature already does, as pondered by a previous poster, has many purposes. If we had machines that could model our brains better, it would shed an awful lot of light on how our brains work. Also, the more tedious work we can offload to machines, the more we can focus on more interesting work. If we could get robots to flip burgers, then eventually we would find better jobs for those people. AI is a lie, in its modern, face value terms given by humans. One apparent and obvious difference, is that a machine must, at any stage, first be programmed. A human, is "self" programmed. Our senses subject the reality to its limitations. These limits are immediately "learned". This is due to emotion and the knowledge of pain, evil and other ethical, philosophical ideas. For a human, touching a searing hot iron, because of nerve sensitivity, allows for a pain response that immediately the mind learns that the nerve has surpassed its limitation of pain / heat damage. The mind then creates a philosophical paradox within an unknown subsystem, where it then recognizes heat and instantaneously associates that "pain" to anything hot. From there, minimum and maximum limits of heat thresholds are experienced and tested and the philosophy of pain then continues its shaping. Eventually, a person knows exactly what pain / heat tolerance they have right down to the digit. With a computer, it's "digit" and limitation is programmed foremost, because this is what is known by the human / programmer. It's programmed backwards so to speak. Eventually, the programmer(s) must formulate complex (and useless) equations that seem to be philosophical in nature, yet, there is no equation for ethical / moral / philosophical inquiry. Take the quote - "I think therefore, I am." How would a programmer possibly interpret this phrase, its meaning, its implications with a string of ones and zeros (1, 0). I'm sorry but it can't. Programming free will, using determined algorithms, is in itself, self defeating, and inherently contradictory. Therefore, it fails.